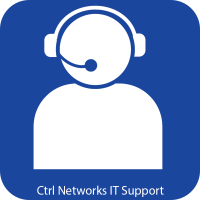 Here at Ctrl Networks, we are number one in the North East for IT Support. We offer both remote and onsite support to help businesses of all sizes. With over 35 years of experience in the IT industry, we can guarantee that we will solve your IT issues. Receive 10% off your first 12 month support contract today. We like to think our customers benefit greatly from the support we provide. With all office hours covered (Mon-Fri, 9-5) and out of hours support available, we’re here when you need us. All support is a phone call away and 85% of support calls can be sorted without a site visit. With our onsite support, all site visits are covered within agreement. Whether it be a small printer issue or a network failure; we’ll be there to fix it. A member of our experienced team will assist you over the phone with any problems you may have. If needed, we can remotely connect to your PC within minutes to solve any issues. Looking for our remote software? Click here! Just like our remote support; a member of our team will assist you over the phone. If our professionals can not fix your problem remotely we will schedule a site visit. This is great for avoiding extra call out charges. Businesses of all sizes benefit from our IT support. If you would like a bit more information on the support we offer, feel free to contact us on the information provided below or head to our Contact page.